Finding a reputable north shore coin dealer is the most important decision when selling gold coins in Covington. Seated in historic downtown Covington, Gold & Silver of Louisiana is a leading coin dealer and north shore precious metal dealer serving all of St. Tammany Parish. We specialize in providing a professional and friendly atmosphere to those selling gold coins, bullion or numismatics. All of our staff is fully trained to properly evaluate collections of any size and value. 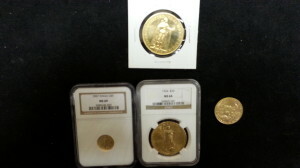 Buying gold coins is quickly becoming one of the most popular way for people to protect the value of their earnings. 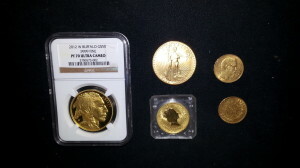 Our company offers a wide selection of bullion products, numismatic rare coins and can facilitate most any size purchase. We are always glad to show our customers a wide selection of products to choose from since not every gold product is right for everyone. Whether you are interested in buying U.S. Gold Eagles, Canadian Maples or private minted bullion bars, we are prepared to fulfill most any request.